The start of the journey near the trailhead. Getting there: Head west on Barton Springs Road and turn left at the first available turn after entering Zilker Park. Drive south as far as possible in the parking area next to Barton Springs Pool. The Hike: This hike starts at one of the crown jewels of Austin, Barton Springs Pool. The spring water feeding this pool provides a constant temperature of 68 degrees year round. Prior to air conditioning these cool waters were a town favorite for beating the oppressive summer heat. 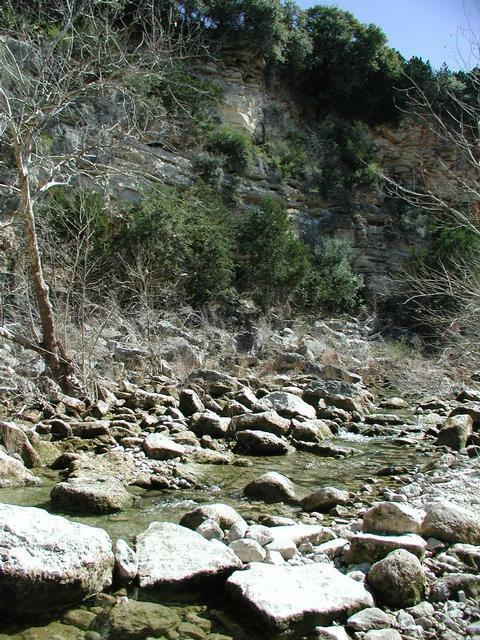 Barton Creek meanders past several sheer rock walls. The trailhead starts just west of the Barton Springs Pool parking area. On our visit this was blocked by a large number of construction vehicles being used to place new drainage pipes under the trail. We saw many signs of their work along the first half of the hike. Until the construction is complete there is a well marked path around the construction area that quickly turns back toward the creek and then begins its journey upstream and away from the center of town. 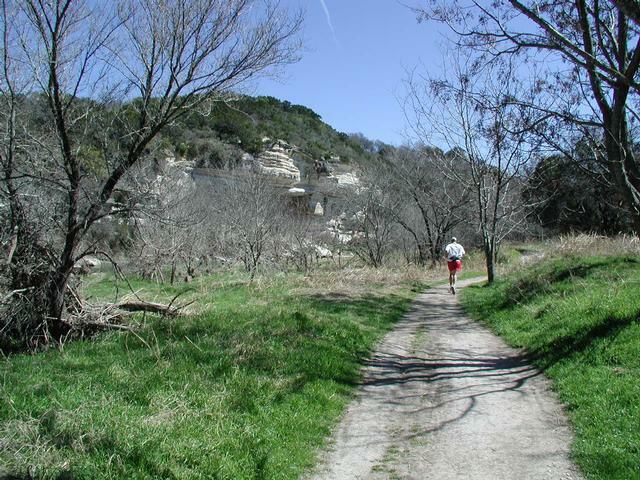 The greenbelt trail is fairly easy to navigate and never gets hilly like some of the hikes farther upstream. 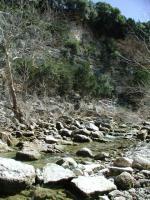 However, the trail can get a bit rocky at times and careful footing is required to avoid twisted ankles. 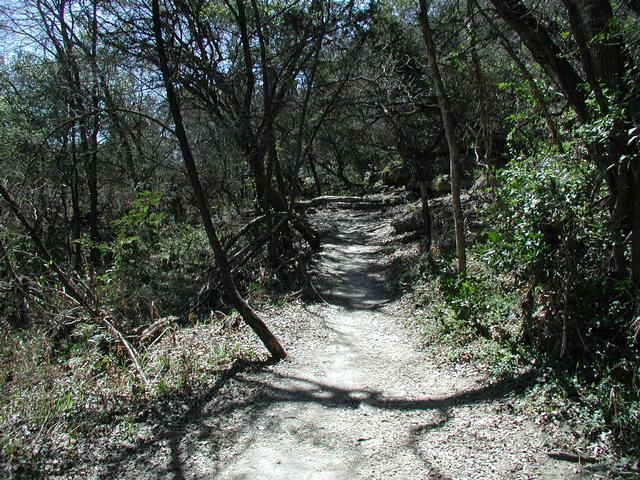 Despite the occasional rough spots this section of the Barton Creek Greenbelt is popular with runners in addition to hikers and mountain bikers. 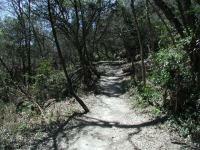 Although the terrain gets slightly rough here and there the trail is popular with many runners. If the rocky spots don't get you maybe the drainage pipes will. An unfortunate companion for the first quarter of the trip was the new pipe the construction crews were preparing for burial. Once in place they will largely be invisible, save for the occasional manhole cover, but in the meantime it serves as a stark reminder of just how close to the center of the city the trail is. 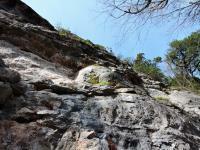 The first waypoint marked "Waterfall" is an interesting jumble of rock just off of the main trail. Head toward the sound of running water in wetter periods. In drier periods it's possible to see through some of the treecover and the shape of the rock is interesting regardless of whether there is running water or not. 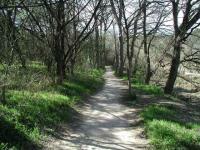 On this portion of the Barton Creek Greenbelt one is never too far from someone. As the trail nears the bend in what is known as Gus Fruh Park there are a multitude of side trails and forks in the path. In general, it is fairly easy to discern the main path and the lesser travelled paths. 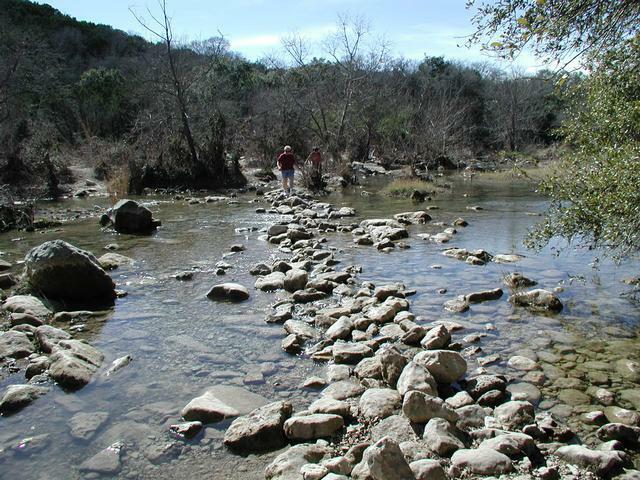 On our trip, we diverged from the main path unintentionally for a moment where Barton Creek splits into two temporarily. As you can see from the topo map we eventually joined back up with the main path at the waypoint "Main Trail". The major creek crossing on the trail is not too difficult. Expect to get wet with higher creek levels. The "Creek Cross" waypoint marks the spot of the main creek crossing. In wetter periods this crossing may require getting a little wet. 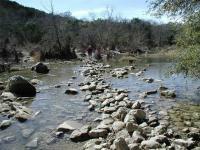 However, there are typically so many rocks piled up along this stretch of the creek bed that it's usually possible to tip toe one's way across without too much difficulty. The rest of the trail is an easy, well shaded straight shot to 360 Trailhead. At the last waypoint marked "Y-Left" take a look to your right across the creek. 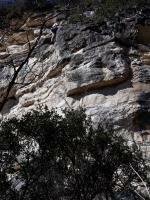 On nice days the sheer rock wall on the opposite bank is one of the most popular rock climbing spots in Austin. The 360 Trailhead is the turnaround point for this hike. Hikers looking for a shorter hike can arrange to use a two car shuttle system with friends leaving one car here for the drive back to Barton Springs Pool. For those making the round trip take solice in the fact that hike back is all downhill! This hike was not nearly as pleasant during our visit as it will be once the construction is completed. If you elect to start from the Loop 360 Trailhead and turn back near the "Captain's Treasure" waypoint you can enjoy the majority of this hike without having to encounter construction equipment. 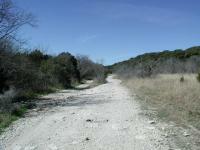 Hopefully the entire trail will be returned to the runners, bikers, hikers and animals in the near future. A good location for an after-work hike for those who work downtown. 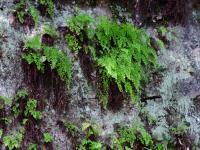 Some of the creek views are espcially lovely, as are some of the fern-covered seeping bluffs. Decided to hit the north end before Barton Pool got popular. Really enjoyed the north end. So much to enjoy on every part of this hike, though it is more fun with water. Bunch of kids climbed up to a cave up in the hill. first time i have hiked this section when there is actually water here! scrambling to the cave entrance is trickier when you can't just stroll along the dry creekbed. saw a snake swimming along quite happily in the beautifully clear water. not many people around today, or is this section not as popular? i always enjoy hiking the greenbelt. saw a few lizards along the trail and a smattering of college boys in the water. Started at the 360 trailhead walking towards Zilker Park. Only water found was in the pool at Zilker Park. climbing close to the area that had climbers practicing.on cliffs. Saw a few houses on the top of the cliffs and some apartment builings. Not many bikes early in the morning, just walkers with some dogs. Stay on trail as when we got close to Zilker park, there were warnings of the poison ivy. Creek was dry as a bone. No water crossings at all. More fun when off the trail and in the actual creek bed when possible.